We all know why we need a CB Antenna. But what about a CB whip antenna? You may be a CB radio enthusiast always searching for radio with the best efficiency. If not, perhaps someone who’d love streaming through the road with CB radio stacked inside the vehicle, working at its best. You may have bought a new CB radio to jam with other truckers but the signal quality couldn’t be great. Well, Worry not! We’ve got the solution for your problem; buy a good quality antenna for your CB radio. These antennas are responsible for bringing out the best in CB radios. Talking about the best, what is the best antenna to look for? Though there may be many kinds of antennas, CB antenna whip will win for many cases. But, why? 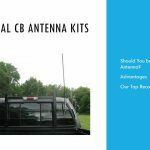 Let’s take a deep look at why these CB antenna whips stand out from the rest! 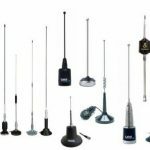 1 Why should You buy Whip Antenna for Your CB Radio? Why should You buy Whip Antenna for Your CB Radio? With other antennas out there designed for CB radios, handheld devices like mobile phones or walkie-talkie, you’ll wonder, why must I go for whip antenna? Obviously, every kind of antennas would have its pros and cons. However, if you just cannot compromise on performance, whip antennas are indeed the best choice. Along with performance, one may look into many other factors that would persuade him to buy these. In case you’re looking for the following factors, you’re on the right track. 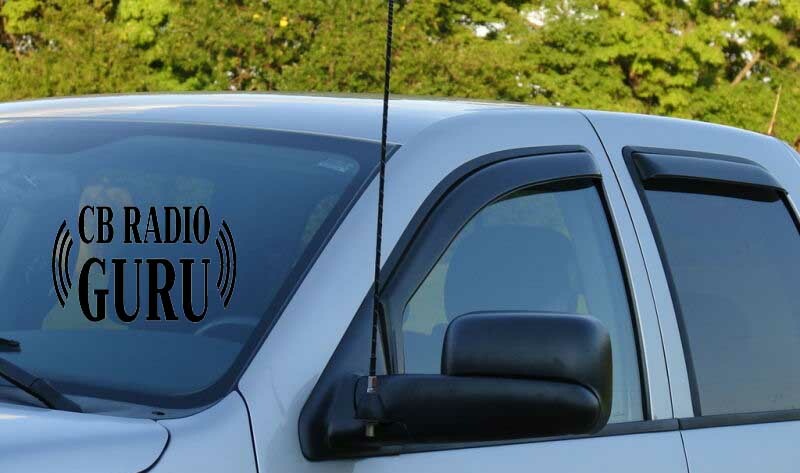 CB radio whip antenna is undeniably the most favorable. It is highly reputed in terms of performance compared to other radio antennas such as fiberglass, trucker antennas or magnet mount antennas. Most whip antennas come with 102”. For those, you need not worry about any coil location since 102 inches represents a quarter of CB radio’s wavelength. Whereas, most of the antennas wrap up 120 inches of wire tightly to simulate a 102″ whip. If you plan on buying radio antennas for your car that involves too much “onto the long drive”, consider buying whip antenna. You’ll get 10 miles at the very least, usually more, to connect with your friends left miles behind. Keeping size of this incredible CB antenna whips in our minds, and of course, incredible performance, these are considerably inexpensive. You don’t require to throw a lot of money over already expensive cars to make your CB radios work efficiently. They are incredibly flexible. CB whip antennas are designed to be tough against hostile weather. They do not break or suffer in case of harsh wind that you may encounter while driving your vehicle. One main reason to go for CB whip antenna is its electrical or mechanical simplicity. It requires little or no installation. 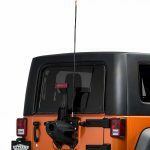 These antenna whips can be directly connected to the wireless transmitter, receiver, or transceiver in your trucks or cars. Even if someone plans on buying a particular type of antenna, they get stuck into which product to buy or which brand to look for. Of course, we’ve also looked into this matter and presented the best whip antennas for CB radio to buy. Hustler’s IC56 is whopping 102inch whip antenna designed from 17-7 PH tapered stainless steel. This delimits bending that may occur if your truck intercepts branches or bushes. With this fine quality material, you can even bend it 180 degrees. Surprising enough, it will go back to its original form. Perfect for all kinds of bumpy road and offside terrain. It comes with dissipation tip that lessens unwanted static that builds up on antennas. This 102” long antenna fits all 3/8 x 24 threaded mounts. Frequency range is 26 to 30Mhz. However, it does not come with any set of screws on mounting. Receiving distance is incredibly higher. It doesn’t require any illegal mods such as power booster. Still, it can catch signals easily from ham and CB. No noticeable degradation of signal even if you try tying it with 550” cord on your Jeep Wrangler Snorkels. This is excellent even for scenarios where your truck or jeep is more susceptible to constant moving and shaking. If you plan on mounting it on top of your track hoe or drive through the areas with lots of trees, choose this whip antenna. Welded studs hold it up well. A little bending is however experienced for a small fraction of consumers. 102″ Inch CB or Ham Radio Antenna having adjustable SWR. This whip antenna is designed with stainless steel, perfect if your car is mostly kept in moist environment. It also Fits all 3/8 x 24 threaded mounts. This product comes along with AS1 Mounting Stud and Allen Key. Great in terms of SWR adjustments. It can instantly be 1:1. The two set screws hold it up in its place. Very clear reception. Even if you go up on a hill, lowering the squelch, you can still talk to the truckers being many miles away quite clearly. The whip antenna is not adjustable. You need to cut it if you want to lower its height. This CB antenna whip should be in the possession of any trucker or RV driver on road. It is a 500-watt, 57.25 inches whip antenna designed with 17-7 stainless steel. Does not require static ball since it has specially designed radius tip to dissipate static. Static damping can be reduced with isolation chamber. K-40 antenna gives us a universal mount feature. For easy tuning, this whip would retract 2.25” into coil. Quarter-turn release easily removes whip and coil. The base can rotate 30 degrees for appropriate vertical polarization. Consumer-friendly in terms of installation and removal. You may be stuck in an emergency, need to remove it from your car; this product makes it easy to do so. Excellent when it comes to range. You can easily get good range (5 miles at the very least) in a jammed area, stations or town. High-class construction for supreme reception and higher performance. Comes with an exclusive capacitor for steady SWR across all 40 channels. The signal loses its clarity if you keep on hitting trees or bushes a massive number of times. This CB / Ham Radio 102” antenna whip is encased in 17-7 ph stainless steel. Consists of mounting stud that are SWR adjustable. It fits all 3/8 x 24 threaded mounts. Excellent quality, shipped in PVC tube. Wilson is a reputed brand in this antennas’ industry. The reason is that the products are admired and loved by the customers because of its high performance. This product is 66inches long. It is in fact, a replacement steel whip antenna for CB radio. This replacement CB radio whip antenna is long tapered w/ tip. It features work as described without any overstatement. You may not even require cutting it down for many as it would fit for a Wilson 1000 magnetic mount or Wilson 1000. This product, however, according to someone that officially bought, does not come with mount stud. We’ve planned to walk you through on how you may be able to buy a good antenna by yourself. For this, the most important things that you should keep in your mind are as follows. Type of Antenna: Selecting the type of antenna is of paramount importance. You should know that there are different types of whip antennas. Here is the type of antenna you should go for according to the vehicle you own. Cars: Magnet roof or trunk antennas. Pick-up Trucks: Fiberglass top-loaded antennas. Semi-Trucks: Fiberglass top-loaded antennas and center-loaded steel whip antennas. RVs & Motor Homes: No-ground plane (NGP) top-loaded fiberglass antenna. Tunable tip: The antenna with a tunable tip often has a screw at the end of it. This allows easy altering of antenna height for tuning. Before buying the antenna, if you are looking for proper tuning, buy those antenna whips that offer a tunable tip. Antennas not having this feature often lead to physical cutting to be tuned properly. Needless to say, they are often more difficult to tune. Mount Compatibility: One other factor which you need to keep in your mind while going on ‘best CB whip antenna’s shopping in town for your vehicle is mount compatibility. If you fail to check for it, chances are that you get stuck, all depressed, with the antenna for mount totally different from what your vehicle offers. However, almost all antennas use standardized 3/8” x 24 connecting thread which is embraced by nearly all of the existing antenna mounts (approximately 99%). Still, it is critical to make sure of the fact that your vehicle’s mount will be suitable, strong or sturdy, enough to support the type of antenna you chose. Customer’s Reviews: Before buying any product, check for customer’s reviews for your satisfaction. This can be very relatable and helpful. For example, if you’re one of those drivers who would crash through unnecessary twigs and bushes, find a review resembling your situation.If that person has given the product 4 or 5 stars, congratulations, you’ve just found the product best made for you. 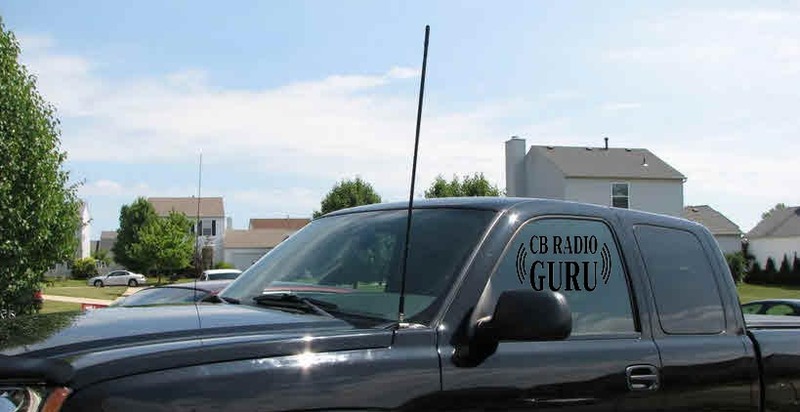 If you want your CB radio’s performance to be enhanced to a greater degree in a lower budget, opt for whip antennas. They are flexible, durable and has incredible range. Go for the products that can take up a massive beating and offers great features like easy installation, great power, tunable tip or resilience. With a strong case of its own, CB whip antennas are one of such kind you need in your vehicle; for higher performance and ease of use.